Picture of a pair of Canadian Geese with their goslings next to the Marsh Boardwalk at Point Point National Park, Ontario, Canada. in Point Pelee National Park, Ontario. We'd just arrived at the Marsh Boardwalk when this family of Canadian Geese exited the lake and took to dry land to graze. They sure drew a crowd of visitors but it was evident that this was their place and regardless of the crowd of people nearby they were staying. Whenever someone would get too close they'd hiss and if the intruder persisted they'd flap their wings and hiss - a prelude to charging and making physical contact I guess. 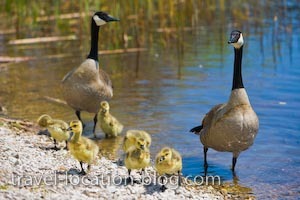 A pair of Canadian Geese, Branta canadensis, with goslings at the Marsh Boardwalk in Point Pelee National Park, Lake Erie, Leamington, Ontario, Canada.